The aim of this essay is to defend the unitary rationality thesis. Inasmuch as the latter satisfies the requirements of both scientific rationality and broader theoretical rationality, it can also be the basis of the epistemic legitimation of rational forms of faith. The essay is divided into three parts. In the first, I endorse the thesis of the demarcation between scientific and non-scientific knowledge. This thesis, however, does not allow us to restrict knowledge to empirical knowledge. It is possible – or even necessary – to know something about the world without resorting to empirical confirmation. This second thesis is put forward in the second part. In the third part I try to show how a reason that reflects on itself – and therefore recognizes its strength, but also its limits – can be a space of openness towards a justified rational faith. In the development of the whole essay the function of Bayes theorem is central. According to Heidegger, European Metaphysics considers time primarily a succession of moments. He holds the view that this understanding of time is a derivative one. In his eyes, the metaphysical tradition neglects that temporal succession originates from ekstatic temporality. Heidegger considers Hegel a classical representative of this shortcoming. The paper intends to show that Heidegger ignores the very core of Hegel‘s theory of time. In his Encylopedia, Hegel deals with temporal succession in the Philosophy of Nature and with ekstatic temporality in the Philosophy of Subjective Spirit. According to Hegel, subjective time poses and presupposes the succession of natural processes. Hegel arrives at this conclusion by a critical reinterpretation of Kant‘s account of time. The aporias in Husserl’s phenomenological analysis of time-consciousness can be resolved in a Hegelian perspective. Husserl’s phenomenology provides a framework for a post-metaphysical transformation of the Hegelian account of time. This paper examines some parallelisms between two theoretical debates that began in the first decades of the 20th century and that have as a starting point the belief that the world, in its present form, lacks sense – the philosophical and theological reflections following the death of God, on the one hand, and the contemporary discussion on the messianic notion of history, on the other. Both consider God as absent from this world, both maintain that this world is therefore meaningless, and both look for ways to overcome the lack of sense of the present world. The former explore the paths opened up by the death of God, and rises within Christianity – although the Holocaust unleashed a similar discussion within Judaism. The second revolves around how history and the mythic stage will be lead to a conclusion by a messiah that will bring with him redemption, and acquires a significant dimension among some libertarian authors within contemporary Jewish philosophy. Among the various reactions to the death of God there are several proposals that do not consist in overcoming such nihilism, but rather regard it as a fertile ground and therefore propose embracing it and accommodating it – the proposals of the authors belonging to the so-called radical theology, which can be traced back to Bonhoeffer and Jüngel but is also nurtured by Postmodern continental philosophy. The aim of this paper is to point out that within contemporary messianism there is also at least a proposal that reads the absence of God in such a fertile way – Derrida’s messianicity without messianism –, and to analyze its logic and compare it to the one underlying the celebrative reactions of radical theology. The goal of this article is to account for the presence of the creatures known as demons in the theological and cosmological system of the early Stoics, such as Cleanthes and Chrysippus, and to demonstrate that they are not superfluous entities in the Stoic thought as Algra claims. In the first chapter I will briefly analyse the demonology of early Greek thought. In the second chapter I will focus on the role and characteristics that Cleanthes and Chrysippus assign to the demons. Plotinus’s normative structure of reality shapes it as a two-ended (the One and Matter) threestaged system (the One, Intellect, Soul) across which it is possible to move from one stage to the other. In this paper I undertake a close reading of Enneads VI 7.33.30-38, enlightening it by other passages of Plotinus’s, in order to understand what happens at the bottom of his hierarchy of being, when sensible objects are created and men have the experience of beauty. I intend to prove that within Plotinus’s thought there is a logical correspondence between his conception of the origin of shapes and the apparition of beauty. The article demonstrates how the unitary conception of man, understood as ‘substantia rationalis constans ex anima et corpore’ (Trin., XV, 7,11), which scholars usually attribute to the second phase of Augustinian thought, that is to say that of time of his priesthood and his episcopate, in fact it is already present in him since the youthful period of his second Roman stay, at least since the De moribus ecclesiae catholicae et de moribus manichaeorum. Work in which the influence of his Roman meditations on the sacred Scriptures are, for the first time in a substantial way, acquired by his way of understanding and rethinking the problems that he intends to face, according to a more Christian perspective. Traditional studies have always been interested in the development of the theme of analogy in the writings of Thomas Aquinas, particularly as regards the relationship between creature and creator. Aim of the present research is to look into this relationship from the point of view of the mutual knowledge, in order to examine the plausibility of the proportionality: ‘God is to his knowledge as the creature is to his knowledge’. In doing so, three of the most important Aquinas’s works are considered, the Scriptum super Libros Sententiarum, the De veritate and the Summa contra Gentiles, considering both the role of intellect in the investigation of God and the active and creative nature of the divine scientia. In his last work, The Book of Experience, Emmanuel Falque comments on several authors who bridge the 11th and 12th centuries: Anselm of Canterbury, Hugh and Richard of St. Victor, Aelred of Rievaulx and Bernard of Clairvaux. These authors are the first to have meditated on experience as it is lived, the experience of thought or of prayer, the experience of reading where worlds resound, the experience of affect or of love. The work is enriched by the author’s studies of contemporary phenomenologists as well as by his views on the intertwining of philosophy and theology. The article contains a reconstruction of the fortune of Ulrich of Strasbourg’s De summo bono in Tuscany during the fourteenth and the fifteenth centuries. 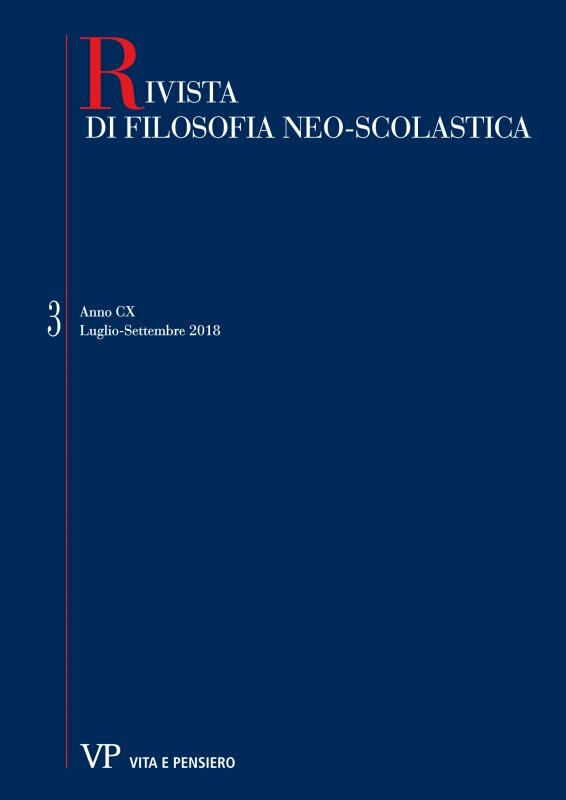 This study reveals a massive influence of the German medieval philosophy on the Italian Reinassance thought. Despite Scholars agreeing that ethics was a subject of extreme interest in the Italian Renaissance, the impact of Albert the Great and Ulrich of Strasbourg on the ethical debate in Tuscany is almost completely neglected. However, Bartholomew of S. Concordio, Bernardino of Siena and Antoninus of Florence widely quoted Ulrich in their works. On the one hand, Ulrich’s ethical doctrines were simplified and vulgarized, thus making Ulrich’s ethical discussion accessible to unspecialized and illiterate readers. On the other hand, Ulrich established himself as one of the most influential authorities on moral philosophy, canon law and economics. At times, intending to emphasize the dynamic character of the human person and the Kierkegaardian concept of the self as a task to be accomplished, we deny the possibility of a constitutive self that is prior to or independent of its own action. In this article, I aim to show in two steps that Kierkegaard’s vision does not exclude a metaphysical approach anchored in being. First, I point out that Kierkegaard himself moves on the plane of being, in addition to that of action; and second, I propose the metaphysics of Thomas Aquinas as a way to combine both aspects of the person, the constitutive and the dynamic, and thus show the compatibility of Aquinas’ and Kierkegaard’s thought. Starting from the ‘paradox of the phenomenological proposition’, arising once the natural attitude has been ‘epochized’, the A. observes that the space circumscribed by the transcendental language is connoted, in Husserlian reflection, in the same way as a blank, a lacuna capable of marking the conceptual limit of each presence of sense, preserving in itself, as pure form of hollow, every phenomenon not yet subject to conceptual synopsis. The main purpose of the present essay is to try and trace back Romano Guardini’s conception of art through a focused reading of his work. In the contest of the idea of polarity, which gives structure to the living-real, and starting from an experience of meeting which stimulates creativity while determining the dynamics of knowledge as much as those of aesthetics, the first formation of images from the primordial experience of the sacred manifests as the vital center of every artistic experience. This is clear both from the point of view of the production and that of the fruition of the piece of art. The experienced intuition of the sacred, through cults and liturgies, is the coherent framework in which the piece of art manifests as a promise. Starting from such a point, Guardini’s actuality will eventually become evident and able to cope with the most recent researches in aesthetics, psychology, and history of religions.